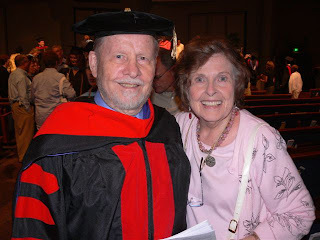 Betty and I express our deepest gratitude to our family and friends who have encouraged us throughout the arduous years I have labored to earn a Ph.D. in Religious Studies. The degree was granted in March, 2008, upon the successful defense of my dissertation: Michael Behe’s Concept of Irreducible Complexity: the Microbiological Challenge to Darwinian Evolution. The title looks complicated, but the argument is simple. Charles Darwin’s theory of the evolution of life by random chance and natural adaptation will not stand up to recent discoveries of the complexity of living cells. They are not blobs of jelly, but complex microscopic motors. Don’t allow any scientist, science teacher, liberal thinker or television program to tell you or your children that the universe evolved without God. The first verse of the Bible stands intact: In the beginning God created the heavens and the earth (Genesis 1:1). Because of its importance to your view of ultimate reality and your relationship with God, I will expound this subject further in future Perspectives. Graduation ceremonies for Trinity Theological Seminary were held in Evansville, Indiana, on August 1 and 2. Graduation speaker was leading Christian apologist Norman Geisler who exhorted the graduates on the importance of apologetics: “Always be prepared to give an answer to everyone who asks you to give a reason (Greek, apologia, defense) for the hope that you have” (1 Peter 3:15). This is more important than ever in our present pluralistic society. This graduation photo was taken by our daughter Joan who, with her husband, Dan Snively, drove us there and back and shared the celebration. They have been our Number One support team. They also planned and will direct a family reunion on a Tennessee hilltop near Gatlinburg August 15-17 to celebrate the graduation and our Sixtieth Wedding Anniversary.